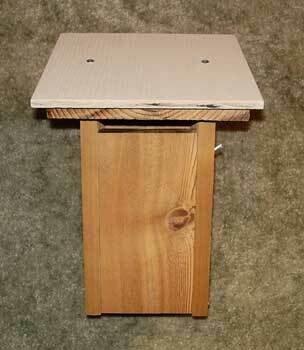 This box was designed by Douglas DesPain, which was approved by the North American Bluebird Society in April 2006. See link to plan. 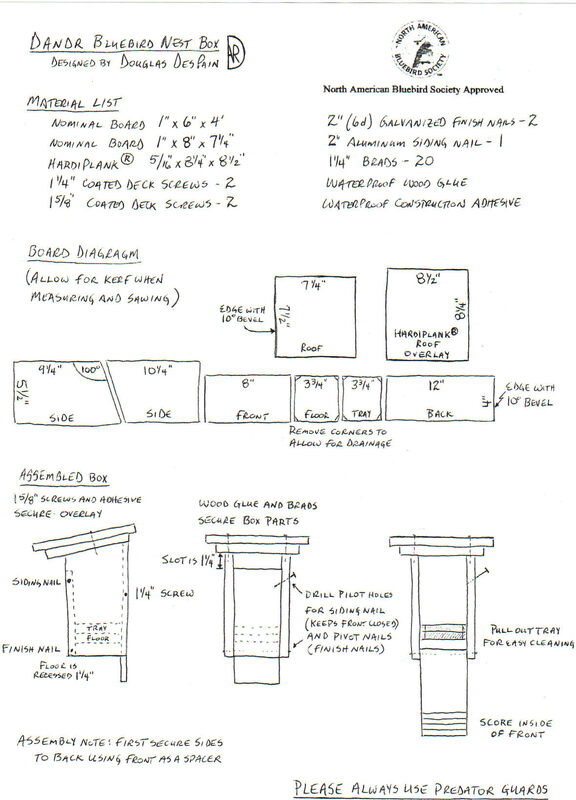 Also see Nestbox Styles Pros and Cons. Slot design. Double roof. 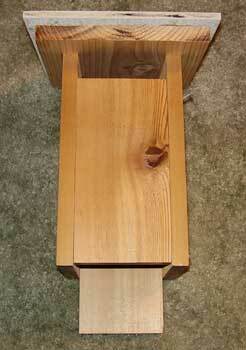 Lower roof is 7.25 x 7.5" with a 10" bevel. Overlay is Hardiplank, 8.25 x 8.5". You may be able to get Hardiplank scrap from a lumber yard or builder. The dimensions of the floor are 3 3/4" x 4". The slot is 5 1/2" above the pullout tray. The box is sturdy, the Hardiplank overlay is extremely durable (will not warp), attractive, and inexpensive and relatively easy to build. Holes can be drilled in upper part of sides if increased ventilation is desired in hot locations. 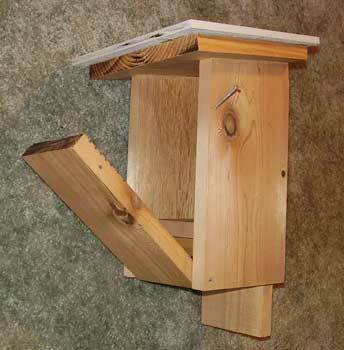 As with any slot box, make sure the opening height is correct to prevent a starling or Red Headed Woodpecker sized birds from getting in or grabbing eggs or nestlings. Kerfs are scored on the inside front of the door, which especially helps weaker-legged Tree Swallow nestlings exit boxes. Keith Kridler recommends using a 1/4" or even an 1/8" round over bit in a router to "round over" both sides of the front so the birds entering the box won't scrape their breast bone or get feather wear from sharp edges. Keith also thought the sub-roof could be made a little smaller to save on wood. Make sure that the bottom board is recessed 1.25" MINIMUM so there is clearance between the pivot points and the box front and bottom.